Bring traditional shape and color to your watering equipment with the Esschert Design Cast Iron Classic Garden Hose Holder. This decorative, sturdy holder lends an ornate hint to your wall, while helping keep your garden hose tidy and within reach. The extended back plate attaches to your wall easily, and its deep brown hue highlights the outdoors. A smaller front panel mimics the curves and points of the back plate, while flower and rope detailing completes the elegant look. A 5.5" wide, arched center section holds a wealth of garden hose, helping your garden remain organized. The solid, cast iron body of the holder offers both durability and style, while its brown and black tones create a sophisticated motif. 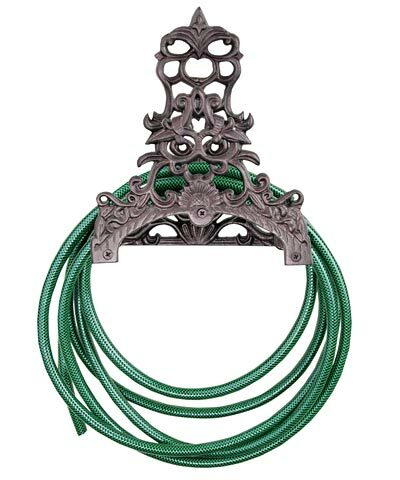 Keep your garden hose nicely coiled on this Cast Iron Classic Garden Hose Holder. Availability: 5 in Stock. Ships from OH within 24 business hours , 5 available at this price!